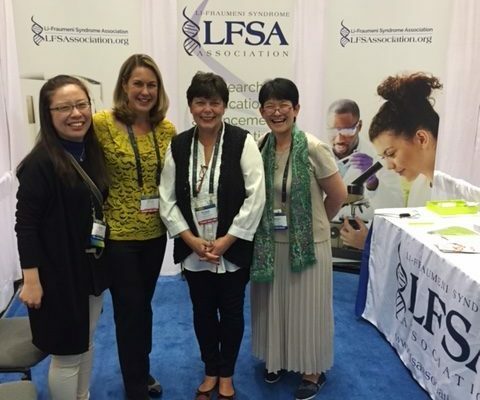 Representatives of LFSA are attending Rare Disease Week in Washington DC with an exhibit at the National Institutes of Health (NIH) at their on-campus Rare Disease Day event to raise awareness for Li-Fraumeni Syndrome. Our volunteer board members, Vice President Susan Faulkner (center left) and Co-Founder/Marketing Chair Debbie Soprano (center right), are at the National Society of Genetic Counselors Annual Education Conference in Seattle this week spreading awareness of LFS for you!! Go, Team LFSA!!! Three Studies to Be Featured at the NSGC 35th Annual Education Conference SALT LAKE CITY, Sept. 26, 2016 (GLOBE NEWSWIRE) — Myriad Genetics, Inc. (NASDAQ:MYGN), a leader in molecular diagnostics and personalized medicine, today announced it will present three new studies at the National Society of Genetic Counselors Annual Education Conference being held Sept. 28-Oct. The cancer predisposition revolution – How was the inherited basis of cancer foreshadowed? The cancer predisposition revolution How was the inherited basis of cancer foreshadowed? By David Malkin, Judy E. Garber, Louise C. Strong, Stephen H. Friend Click here to download the article. PBS, LFS, and elephants: Elephant genes hold big hopes for cancer researchers. After the loss of his family to LFS, Michael James celebrates the life he had with daughter, Dolly. Mr. James continues his fight and support by raising awareness of LFS and the LFS Association. Read more.